Out-of-this-world action figures from Star Wars: The Force Awakens and beyond! 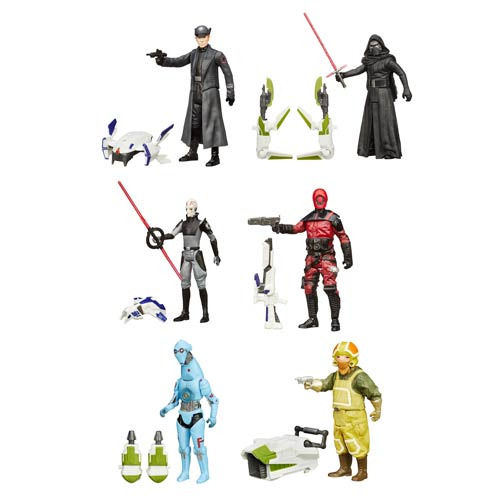 The Star Wars The Force Awakens 3 3/4-Inch Jungle and Space Action Figures Wave 2 Case includes 12 action figures with awesome accessories - including bonus weapons that can combine to bigger and badder gear! Tour the galaxy with the Star Wars The Force Awakens 3 3/4-Inch Jungle and Space Action Figures Wave 2 Case! Each 3 3/4-inch action figure includes a pair of accessories - or possibly even more - from a galaxy far, far away. Feel disturbances in the Force, and then shoot at them, with this exquisite collection of action figures. Most action figures feature 5 joints each. Ages 4 and up.